I killed an earwig and a woodlice today. I didn't mean to, but I was painting our garden fence and somehow I painted over them without realising. "So what," you might say. Well, I try never to kill or hurt anything - it's one of the reasons I'm a vegetarian. I've even been known to ask ants, who have decided to make a home in my lawn, to 'please move away.' The strange thing is, they often do! I promise the ants I will put out some sugar out for them on the other side of the road, where there is a river and a small wood. And off they trot ... actually, I have no idea if they really like sugar but they seem to all disappear somewhere, perhaps not exactly trotting - but their mode of movement isn't really my concern. 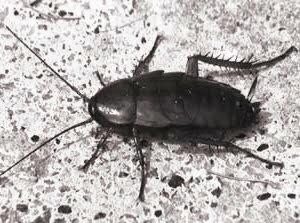 I've written previously about the theory that mankind creates the likes of cockroaches, bugs and so on with our thoughts. Our not very nice thoughts that is. Richard Ingalese, in his book The History and Power of Mind from 1904, reckons such creatures are created by our 'licentious, obscene thoughts.' So obviously I don't create these myself, okay maybe a few at odd times. Ingalese writes, "... these miserable creatures born of man's lower mind cannot use atoms of higher rate vibration for their bodies, but must use those atoms which they vibrate harmoniously with. They gather up diseased atoms, dirty atoms, those atoms which can no longer be used by men or beasts, and through forms composed of these, express themselves upon the material plane. And thus man creates the destructive things of earth which rage war against him ..."
I suppose this indicates how careful we have to be with the thoughts we allow ourselves to dwell on. Oh, and if bugs, cockroaches and the likes are created by our 'dirty' or low grade thoughts does this mean it is, in fact, okay to destroy them? Or is all life sacred? I don't create any such creatures, believe that believe anything! Hi Mike...you always keep me thinking with your blog! I actually dropped by because I wanted to say that I'm quite impressed with your blog site and have been for a while! Therefore I thought it only fitting that I share an award I recently received with you! Here's wishing you much happy blogging! This morning my son spotted a rather large spider in the foyer...large enough that we could see it's shadow. I told him to leave it alone...my mom used to say spiders bring money. Next I'll be getting out Trish MacGregor's book about symbolism...these tiny creatures are messengers from our guides of course. I actually think we should never kill anything. Can't say I have always been able to hold to that though...especially mosquitoes. I try not to kill any creatures too, Mike. But I draw the line at centipedes. If I see one of those in my house, I WILL stomp it with a shoe -- apologizing all the while! "Sorry I have to do this." I just can't comfortably live with 100-legged creatures! Not sure I believe I've created them but...you never know!